Forecasts of 5-10 inches of snow (or more!) have prompted a Winter Storm Watch for much of Western Washington. We want to make sure you have the information you may need should this “Nor’wester” snowstorm be as strong as predicted. Our advice: After the snow starts falling, stay home. Even if you feel confident driving in the snow, it’s better to avoid taking unnecessary risks by venturing out. 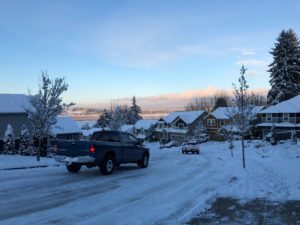 If you have to go out after the snowstorm, be prepared for hazardous road conditions and follow our top 10 tips for driving in snowy and icy conditions. 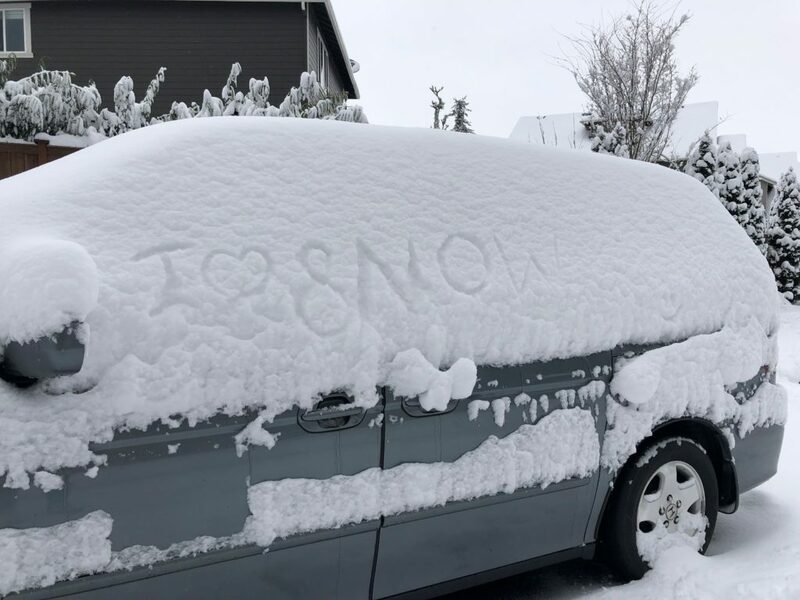 Scraping snow and ice off your car may be the last thing you want to do when it’s freezing outside, but it’s actually the law in Washington state. Before you start driving, clear all the snow and ice off your car windows, mirrors, and roof. Chunks of snow and ice that accumulate on the roof of your car can fly off when your car is in motion, posing a hazard to other drivers. And when you brake, snow on the top of your car can slide forward and cover your windshield. Don’t forget to clean snow off your front and rear lights, too. This will help other drivers see you better. As a general rule, keep your gas tank at least half full during winter weather. You never know what delays or detours you may encounter on your route. If you get stuck, you’ll also want to keep your engine running to stay warm. Speed limits are set for ideal driving conditions. Reduce your speed to account for lower traction when driving on snow and ice. According to the U.S. Department of Transportation, drivers should reduce their speed by 1/2 or more on snow-packed roads. For example, if you would normally be traveling at a speed of 30 mph on dry pavement, then on a snow-packed road you should reduce your speed to 15 mph or less. Be sure to leave lots of space between you and the car in front of you. You need at least three times more space on a snowy road and at least 10 times more space on an icy road to stop as on a dry road. If someone is tailgating you, pull over where it’s safe to do so and allow the other driver to pass. Avoid sudden stops and brake gently to avoid skidding or sliding. If your wheels lock up, ease off the brakes. Don’t get overconfident if your car has all-wheel drive (AWD) or four-wheel drive (FWD). Cars with AWD and FWD have great traction compared with two-wheel drive cars, but when it comes to stopping they’re all the same. If you have an AWD or 4WD vehicle, don’t let that extra traction lull you into a false sense of security on icy roads. If you do find yourself skidding, try to stay calm. Take your foot off the gas and steer in the direction you want to go. Resist the urge to brake while skidding and focus on regaining traction. If your car has antilock breaks (ABS), they will automatically pulse. This is normal. If your car doesn’t have ABS, lightly pump the breaks. If you do have to travel, give yourself plenty of time to arrive at your destination safely. You may also want to drive in a lower gear or the “snow” setting on your car if it has one. This can help improve traction, especially on hills. Never use cruise control. This can cause your wheels to spin at different speeds and may make you lose control. 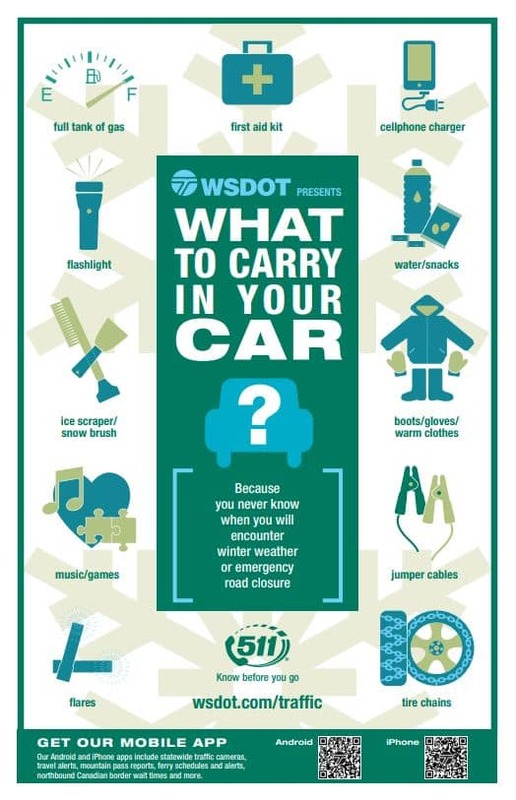 Be extra vigilant on bridges, overpasses, and ramps – and not because the Fremont troll lives under them. These areas can be especially slick since they’re the first to freeze and the last to thaw. Always be aware of your surroundings, especially when driving through residential areas. 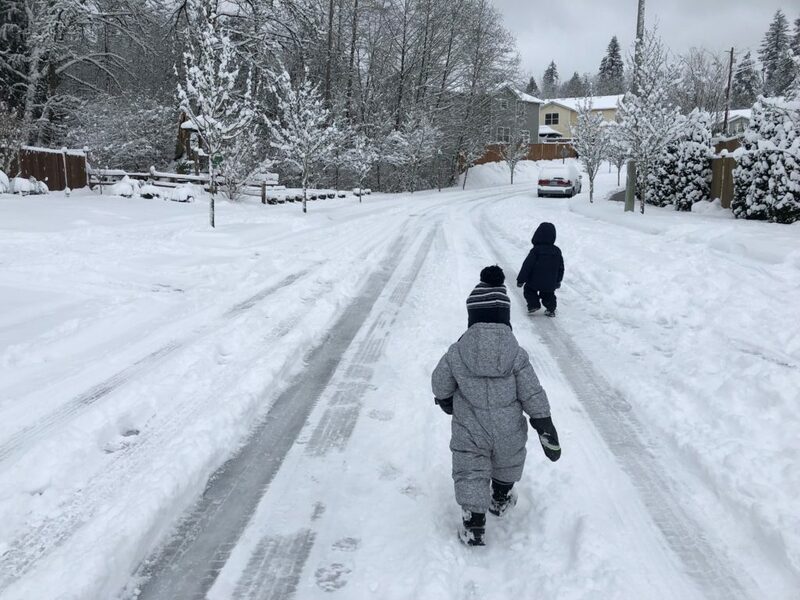 Children love to play in the snow, and they may be walking or sledding on neighborhood roads. Drive very slowly and be on the lookout for kids that may dart from behind cars or snowbanks. If your car gets stuck in the snow, avoid spinning your wheels. Dig snow and ice away from your tires, then try to rock your car free of the snow. Do this by carefully switching from drive to reverse. Go easy on the gas pedal – it’s the momentum that sets you free, not the power. You can also improve traction under your wheels by putting a little sand, gravel, or cat little under your tires. If all else fails, an emergency roadside assistance service can help. If you’re involved in an accident, call 911. Then, move your car as far off the road as safely possible. In poor weather conditions, it could take some time for first responders to arrive. Opt to stay safely inside your car while you are waiting for help. Wear your seat belt in case you get hit by another car, and activate your hazard lights to increase visibility. The one exception to this: if staying in your car puts you in physical danger. For example, the car may slide into a body of water. Open your window a small crack to allow for air to flow in and to keep your windows from freezing. Snow and ice can quickly seal a car shut. If you are sure the exhaust pipe isn’t blocked, run the engine and heater for 10 minutes every hour to stay warm. After you’re home safe, call your local, independent insurance agent – like McClain Insurance. Your agent can explain what your insurance policy covers and assist in turning in a claim if necessary. Next Post: Does Homeowners Insurance Cover Frozen Pipes?